We publish here various pages of historical information and research including Graham Cousin's paper on 'The Building of the Macclesfield Canal', reproductions of reports made during the construction and some of the contents of the diary kept by Edward Hall, for more than 18 years Agent to the Macclesfield Canal Company. See these on the history pages. As with many canals, the Macclesfield passed into the hands of the railways for about 100 years. The canal was bought out by the Manchester, Sheffield & Lincoln Railway in 1847. It was managed with the Ashton and Peak Forest canals, which were owned by the same company, and known collectively as the APM Canals. At railway grouping in 1923 the APM found themselves with the LNER. The canals and the railways were nationalised in 1947and the Macclesfield went to a new body, the Docks & Inland Waterways Board. Commercial carrying finished only in the 1960's shortly before British Waterways was formed. The canal is now part of the network owned and managed by the charity, the Canal & River Trust. Although in need of maintenance, the canal remained navigable throughout and did not require restoration when leisure use began. Indeed, the UK's very first narrow canal cruising club, the North Cheshire Cruising Club (NCCC), was established on the canal in 1943! The state of the canal in those days may be deduced from the name of the NCCC newsletter - Ditchcrawler! It was the heroic joint action of the NCCC and the IWA that ensured that the Macclesfield Canal was not abandoned. The route takes the canal from Marple Junction with the Peak Forest Canal in the north 26¼ miles to the stop lock at Hall Green near Kidsgrove passing along the side of the most westerly Pennine hills through High Lane, Higher Poynton, Bollington, Macclesfield and Congleton, all in Cheshire, and Kidsgrove in Staffordshire in the south. Nowadays we normally regard the last 1½ miles to Harding's Wood Junction with the Trent & Mersey Canal as a part of the Macclesfield Canal although it was built as a branch of the T&MC. The Macclesfield Canal provides the most elevated and, some would say, most beautiful part of the Cheshire Ring. It certainly offers many stunning views over the Cheshire plain. 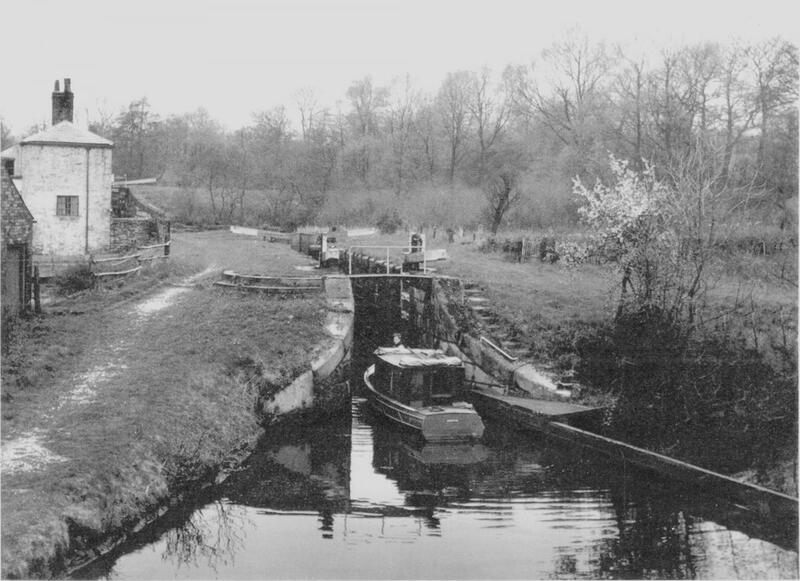 The canal is maintained at two levels divided by 12 substantial stone locks in 1¼ miles at Bosley as well as the (originally double) stop lock at Hall Green. The top level is, at 518 feet above sea level, one of the highest navigable levels in the country. The locks drop the level by 118 feet. Bosley locks are characterised by the unique use on a narrow canal of double gates top and bottom. The stop lock has the further oddity of having double gates at the top and a single gate at the bottom! The canal is noted for its fine stone bridges - particularly the six change or snake bridges where the towpath changes sides of the canal. These bridges were designed to allow the horse to move over without having to untie it from the boat. There are most impressive stone aqueducts at Bollington and across the River Dane as well as many high level embankments and deep cuttings. At Bollington the River Dean is diverted through a tunnel to avoid piercing the canal embankment - a most unusual feature well worth mooring up to view. The canal was built to serve the mills, mines and quarries of the Marple, Poynton, Bollington, Macclesfield and Congleton areas as well as to provide a link from Manchester to the Potteries and Midlands in competition with the Trent & Mersey, Bridgewater route. The traveler will certainly notice the mills (originally for cotton at Bollington and silk at Macclesfield) and the more observant will notice the remains of the hundreds of coal mines in the Poynton and Bollington areas as well as stone quarries on Kerridge Hill, the Cloud and Mow Cop (Mow is pronounced as in cow). The picture is of bridge 92 at Scholar Green. Most structures on the canal are Listed by the local authorities and the entire length is subject to Conservation Area status. From Marple to Macclesfield the Middlewood Way is never far from the canal. This follows the course of the Macclesfield, Bollington & Marple Railway that has been converted into recreational space for walkers, cyclists and horse riders. For a fuller description of the route please look at canalside interests. During the mid 1980's The Macclesfield Canal Society restored the milestones along the whole course of the canal. We normally regard them as unique - we know of no other canal that has stone mile markers of these size and quality. There are a couple of similar stones on the Cromford canal. The Macclesfield's very stout stones had mostly been buried during the second world war as a precaution against enemy soldiers using them to find their way! All but three stones were dug up and re-erected. The three could not be found so they were replaced with new stones cut from Kerridge Hill. Many of the quarter mile stones were also lifted. This project lead to the society's quarterly magazine being called Milestone. Having gained confidence, the next project involved the full restoration of Wood's Bridge 30 between Kerridge and Hurdsfield. This stone arch farmer's accommodation bridge had been much abused over the years, losing most of its top stonework and also retaining its war time defensive tank trap. This has been removed. Next, Gaw End bridge 47 was restored. This is an iron and timber swing bridge just north of Fools Nook and is the only working example of an original Macclesfield Canal swing or swivel bridge. There were originally about a dozen of these. However, in recent times this swing bridge has proven extremely difficult to open as the base has suffered from subsidence and the bridge is now left permanently open. The swing bridge at Fools Nook (br.49) is of modern design and construction and is power operated. During June 1998 BW removed bridge 47 to Northwich Yard to refurbish the turntable. The bridge was re-instated in October 1998. A new foot bridge, no. 48A, was also installed adjacent to the lengthman's cottage between br.47 and Fools Nook. A multitude of lighter works have also been carried out over the years including the installation of mooring rings and the painting of original ironwork at the Dane aqueduct, Adelphi Mill in Bollington and Hagg Farm lattice foot bridge, br.16. Extensive works have been carried out in recent years to clear the foliage away from the railings along the towpath in front of Ramsdell Hall, Scholar Green. A project is underway to re-furbish these beautiful railings and replace the damaged and missing parts. Two reservoirs, Sutton and Bosley, supply the summit pound with water. Both have extensive feeder systems stretching back into the hills above the canal. These have been in serious disrepair. However, The Macclesfield Canal Society have worked with CRT to bring them back into production. This work has done much to alleviate the water shortages that were a notable aspect of the canal in dry years. Find more on reservoirs and feeders. Max: Length 70ft; Beam 7ft; Headroom 7ft; Draught c.3ft 6in. Note that the water level in the top length from Marple to Bosley (and including the top length of the Peak Forest Canal) may be as much as six inches lower than normal during the summer months! This leads to difficulty in mooring away from wharves. The Macclesfield Canal was built as a 'state of the art' waterway. This meant that Thomas Telford, who laid out the route and designed the canal, employed all of the lessons he had learnt on earlier canals. As a result the Macclesfield 'suffers' from the fact that it was designed very specifically for commercial carrying - how was Telford to know that leisure would soon become its principal purpose? The Macc has a very shallow and tapered bottom. The deep channel is just wide enough for two boats to pass in the centre, indeed, deeper draughted boats would question my use of the word deep! The Macc, especially the bottom pound from Bosley to Hall Green, had been in need of dredging for many decades. Much of this length was dredged during winter 1999/2000. The tapers from the deep channel to the bank ensure that the depth at the sides is insufficient to moor at many places along the canal. The canal was designed for boats to moor at the wharves and nowhere else. Although modern steel narrow boats are shallower draughted than a loaded working boat they still find it difficult to moor close in along much of the length. Fibreglass cruisers don't usually experience these difficulties. In modern times mooring has been made possible at many places by judicious dredging and competition for these places tends to become keen at lunch and tea times during the main cruising season! One of the best places is on the embankment above Gurnett aqueduct at Sutton, just south of Macclesfield near br.43. Here BW, some years ago, completely rebuilt the channel in concrete to overcome leakage. The new channel is considerably deeper than the rest of the canal with excellent moorings perfectly located for a visit to the Olde King's Head at the bottom of the steps or Sutton Hall Pub & Restaurant at bridge 44! The maps show the most popular mooring places which tend to be close to the attractions - pubs, shopping and, err, pubs. Up to date information on navigation and maintenance may be obtained from the Canal & River Trust. The Macclesfield Canal Society was established in 1984 in order to defend the interests of the canal and its value to its many users. Meetings are held on the second Thursday of the months September through May at the Silk Trader Pub,Brook Street, Macclesfield. Everyone is welcome. Outdoor meetings or events are also held in June, July and August - see our programme. The North Cheshire Cruising Club (NCCC) is located at High Lane Wharf. The Mary Sunley Canal Boat charity keep their boat at Adlington and the New Horizons charity boat is moored at Marple. Both provide trips for the less advantaged. Further information on a wide variety of canals and inland waterways can be found at George's premier waterways web site. Additional information can be found on many individual canals in Jim Shead's Waterway Information pages and specifically on the Macclesfield Canal. Historic pictures of the APM canals (Ashton, Peak Forest and Macclesfield) can be found on David Kitching's pages. Canal & River Trust information on the canal can be found on CRT's web site.